At Matter of Trust and globalcompostproject.org, we’re committed to promoting natural abundance and composting. We’ve teamed up with experts including scientists, NGOs and agriculture specialists from around the world to share information on a platform to make it easy and commonplace. In 2014, Matter of Trust partnered with Marin Carbon Project (John Wick), The Carbon Cycle Institute (Dr. Jeffrey Creque), UC Berkeley (Dr. Whendee Silver’s Laboratory), Lawrence Berkeley Laboratories (Dr. Gary Andersen), and many other organizations and waste diversion experts to establish the Global Compost Project. Visit the website for resources, partners, pledges and more. Our goal is an awareness campaign and large scale green/brown waste recycling mobilization that creates enough compost to cover millions of acres of government-owned grazed rangelands in the US and beyond. This program diverts organics from the waste stream and promotes composting of soil everywhere it makes sense, in order to help boost photosynthesis so that nature can pull more carbon back into the Earth. Nature is always in balance, but humans only thrive in certain environmental conditions and, says John Wick, “right now, for much of life on the planet, there is too much carbon in the air and too little carbon in the soil”. Human activity, such as mono-cropping, tilling, mining, drilling, fracking, logging, slashing and burning, under grazing, overgrazing, factory farming, and the use of polluting pesticides have depleted our soils. These practices can cause ecosystems to crash and some landscapes to off-gas CO2. Compost is an easy, natural human invention that boosts photosynthesis while cleaning up the mess we’ve created. Two peer reviewed studies that took place over a seven-year period clearly demonstrated proof of concept. 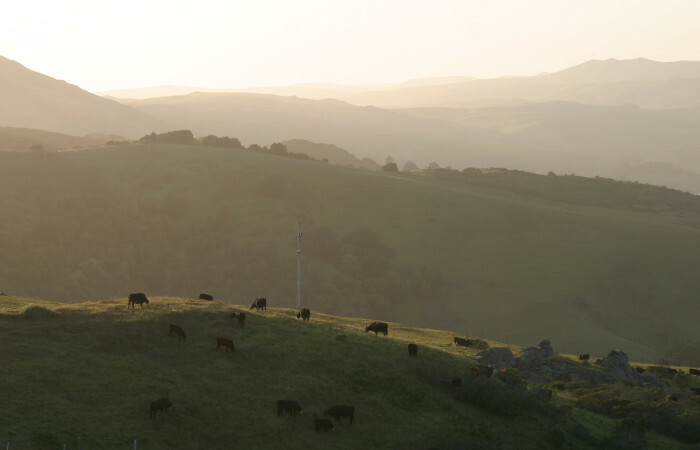 The Lawrence Berkeley National Laboratory and Marin Carbon Project found that by spreading roughly 1/4 inch (1cm) of compost on grazed rangelands, the microbes in the soil are activated to naturally sequester more carbon. Via photosynthesis, composted plants and trees intake carbon at greater rates, averaging 1 ton per acre per year for up to 30 years. The results are delighting water conservationists, microbiologists, and climate change scientists around the world. Compost replenishes the soil carbon to balanced levels. It is as if the eco-systems are rebooted, and within one to five years native grasses and wildlife rebound. The carbon intake, forage capacity and water retention return to more normal rhythms. Rangelands are key because grasses can withstand decades of drought and have roots that grow vertically straight down (as much as 30 feet) pulling carbon deep into the earth. Trees are also very important in the carbon cycle. Trees are more likely to grow near water sources and have roots that fan out horizontally. Grazing lands are most efficient when animals eat only the green tips and don’t pull up the vital roots. The grasses then regrow and continue to pull in more carbon. The key is to neither undergraze nor overgraze rangelands, but to work naturally with the optimal strategy for each ecosystem. Carbon sequestering techniques include multi-strata farming, managed grazing and many more. Aerated compost rows with active, natural bacteria reach steaming temperatures of 131 degrees Fahrenheit (degrees 55 Celsius) that continue for three-week spans. This thermophilic composting of green and brown waste can breakdown toxins and synthetic compounds (medicinal, chemical and hormonal) due to the sustained high temperatures. Want to know how you can impact climate change from your own kitchen? Find out more about the Global Compost Project and make a pledge here.